My husband needs a crown. Lucky for him, his father-in-law is a dentist! Unlucky for him, a crown typically takes two to three weeks. Sure, the fitting happens in a day, but then it takes the lab at least a couple weeks to make the custom crown. But NOT ANYMORE! Gather round, my people: Let me tell the sparkling, untold story of A CROWN IN A DAY! Jason and I are home for the holidays for six days. Just enough time to learn how to make mama’s famous green salsa, play a couple games of Canasta, and remind Kisses the dog who her favorite Medina is 🙂 Not enough time for a full dental crown placement! UNTIL NOW. First of all, what is a crown? “A crown is a way to replace the outer layer of the tooth. 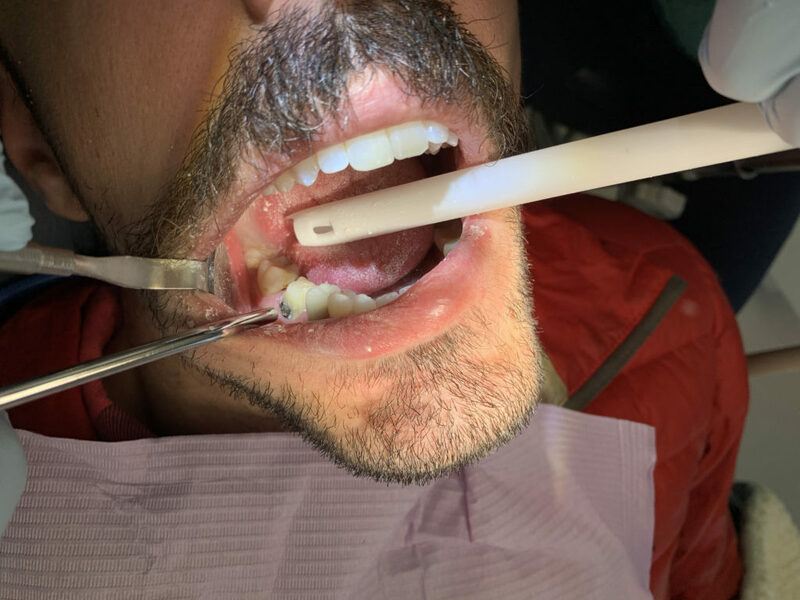 In some instances, it’s done for aesthetics, and in some instances, it’s done to protect the tooth or make the tooth stronger,” says Dr. Medina. Jason sits down in Dr. Medina’s chair on Friday morning. Here’s his tooth while Dr. Medina scrapes away all decay! After the tooth is completely cleaned, Dr. Medina uses one of his new favorite machines to map out an accurate picture of Jason’s mouth. (You may remember biting down on alginate goop that would provide a mold of your mouth. This 3D picture is not only more accurate and more comfortable for you as the patient, but it’s also quickly stored in your dental records!) If this doesn’t sound familiar to you, you’re not alone! Dr. Medina is one of the few general dentists in the area that has the Itero 3D scanner. Is it possible? Can we get A CROWN IN A DAY? 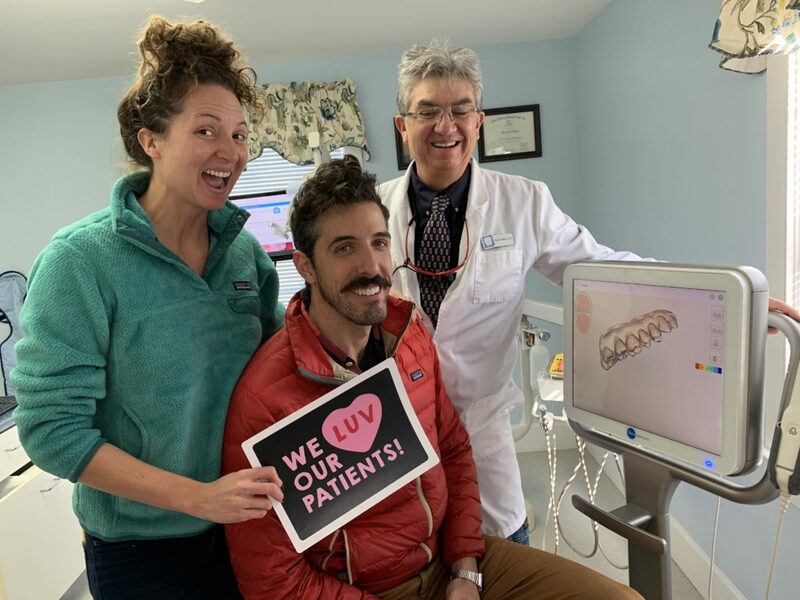 Look at this happy patient with his favorite dentist and dental assistant! We luv our patient, Jason. After this, it’s chill time for Jason while the Glidewell’s Fastmilll.io gets to work. The Glidewell is a milling unit that starts out with a cube of zirconium, and it creates a personalized crown by cutting away at the zirconium until only a perfect replica of Jason’s tooth is left. This is the part that normally takes three weeks at a lab. Instead, here at Seasons of Smiles Dental, the tooth is ready in one hour! Once the crown is complete, it takes Dr. Medina twenty minutes to permanently place it in Jason’s mouth. The crown matches Jason’s old tooth in shape and color impeccably. It’s flawlessly designed to touch the front, back and opposing teeth perfectly. Jason stood up out of the dental chair with the ability to chew immediately! Seasons of Smiles is a digital dental office. They’ve had the Itero 3D scanner for two years, and the Glidewell milling unit for two weeks. The milling technology is brand new to dentistry. Seasons of Smiles dental office is one of only sixty dental offices in the United States to have this machine! In Camden for just a day? Don’t feel like waiting three weeks for a crown placement? Call and see if your tooth is a good candidate for this exciting, new technology. Note: This post was written with the patient’s consent. This case and these photos are all used with permission from my sweet husband, Jason. Thanks for this information, with nice example. It will helpful for us. Thanks for stopping by, please give our best to Dr. Kip Saunders out in Texas. Thanks for sharing your knowledge and sweet example of yours. Hello Gilad, I have never been to Israel, hopefully someday. Thanks for stopping by.